Palm Sunday celebrates the glorious triumphant entrance of Jesus into Jerusalem (John 12:1-18). Zechariah had prophesied the entrance of the Messiah into Jerusalem, saying: “Rejoice greatly, Daughter Zion! Shout, Daughter Jerusalem! See, your king comes to you, righteous and victorious, lowly and riding on a donkey, on a colt, the foal of a donkey” (Zech. 9:9). CBF field personnel Marc and Kim Wyatt serve alongside the refugee and internationals community in the Research Triangle of North Carolina. A couple of weeks back I was invited to make a presentation during Mission Sunday of a local partner church in Raleigh, N.C. On that day I took a friend with me, an Afghan military adviser who recently arrived to our area and is staying temporarily with us at Welcome House. Since arriving, he has been asking many questions about what we do and often accompanies me during my daily work of refugee resettlement. He is also seeking to know God and seem fascinated by my faith. I explained that my presentation would be at a church. I told him that he may hear some things new to his understanding of me and of God but that after church I would be happy to take his questions – just not while at church. You see this was for my friend the first time he would ever attend a Christian Church. As I’m sure you could imagine I had mixed feelings about taking my new Muslim friend to his first church experience on that particular day – Mission Sunday. During the presentation I shared the CBF Offering for Global Mission video about another Afghan military adviser named Jay who stayed at Welcome House. In this video, Jay shares of meeting American soldiers in his community in Afghanistan and then becoming a translator for the U.S. military. He shares how he left Afghanistan to find safety in Europe and then later was sponsored by the U.S. to come to America. Here he became the guest of Welcome House. It is a moving story of hope. In many ways we see Jay as much a U.S. veteran as our own soldiers. After the video I asked if there were any veterans in the room. Many raised their hands. Then I introduced my Afghan friend and said that for me he was also a veteran. The room erupted in applause as everyone stood and clapped for him. It took him aback a tad. Later we attended worship together. It was the first time he had ever heard a sermon preached or heard Christian prayers or hymns. It was a day of firsts. Well that must have been a lot to take in all at once. The pastor awkwardly smiled leaning slightly back from him and thanked him for coming to church. Later that same week, the pastor wrote to say how special the day was because our friend had been at church. It was not lost on him that it was his first time of ever going to church. After all you don’t meet the ancestor of a King every day. My Afghan friend has been back to church again; picked up from Welcome House by a deacon from the church. He told me this week he has been invited to go to the church on Easter Sunday and afterward to go home with his new Christian friends for Easter lunch. They are having a smoked turkey this year in his honor. In a very wonderful and unique way my new friend is being welcomed into a new royal family; the family of King Jesus. “Rejoice greatly, Daughter Zion! Shout, Daughter Jerusalem! See, your king comes to you, righteous and victorious, lowly and riding on a donkey, on a colt, the foal of a donkey” (Zech. 9:9). Marc Wyatt serves as one of the Cooperative Baptist Fellowship’s field personnel in Raleigh, N.C., where he advocates on behalf of internationals and refugees. 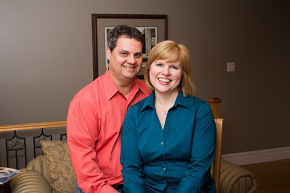 Learn more about the ministry of Marc and his wife, Kim, at http://www.cbf.net/wyatt.